In 1996, the artist chooses the alias ‘Invader’ in reference to the game SPACE INVADERS (1978). Inspired by the famous 8-bit characters (such as Super Mario, Pac Man and Space Invaders) he creates thousands of different mosaics placed in various locations across the cities he visits. In 2011, Invader was rewarded for the E-reputation prize along with Damien Hirst and Sophie Calle. After analysis by Zen Reputation, he is considered as the most famous French artist on the web (excluding the Asian web). He reaches the 27th place in the world. Nowadays around 82 different cities worldwide have been ‘invaded’ by 2732 space invaders. 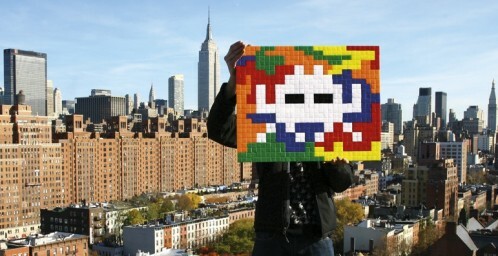 This comes down to 1,5 million mosaics worldwide!Invader’s mosaics can be found in cities all over the world.